White Christmas Card Template is the perfect way to send warm holiday wishes to friends and family. Personalize Christmas wishes with your own photos. 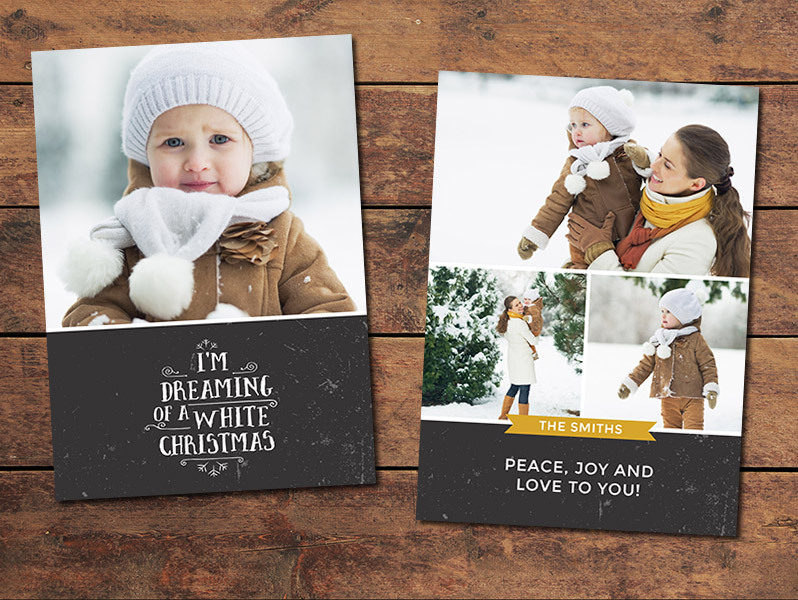 The White Christmas Card Template is in the Ultimate Photography Bundle! Create a beautiful Christmas card for yourself or for your photography clients with this template. Just change the text to suit your needs, easily enter your own photos, and your card will be ready to send to the printer in no time! Offering cards to clients is a great way for photographers to bring in some extra revenue, and clients will love the card featuring your photos and this template. The template is for a 5 x7 card, with both a front and a back design. The template comes in .psd format and is easy to edit in Photoshop or Photoshop Elements. Inserting your own photo is easy. Use a clipping mask (documentation is included in case you are not familiar with how to use clipping masks). The template was designed to the specs of Bay Photo Lab, but can be adjusted to suit the specs of other labs or printers if you prefer. Stock photos are for preview only. Download stock photos from Unsplash.com or use one of your own. Don’t forget to credit the photographer. The download does not include fonts due to licensing and copyright restrictions. However, the download includes a fonts.txt file that lists the fonts used (free to download), as well as the URL where you can download each font.